Along with all the excitement that accompanies springtime is something that few people truly enjoy – spring cleaning. National Spring Cleaning Week, the last week of March, is fast approaching, marking the time of year that three in four Americans take a deep dive into deep cleaning. Even so, many people have developed such distaste for housework that they’re increasingly outsourcing that burden to residential and commercial cleaning services. In fact, cleaning companies are expected to collectively rake in revenues of $65 billion this year. For cleaning and home service businesses, the industry’s impressive demand is nothing new or surprising. After notable year-over-year growth, in one of the most fragmented industries in the country, there’s never been a better time to boost your cleaning brand’s marketing strategy to get ahead of the competition. Your company vehicles carry your equipment and employees from Point A to Point B, but your service cars can also serve as unconventional, yet powerful, marketing tools. Without standout graphics and an expertly-wrapped vehicle, you could be missing out on countless opportunities to catch the attention of thousands of consumers. Vehicle and fleet wraps help you maximize the time spent driving to and from appointments by grabbing other drivers’ attention and showcasing your brand to potential customers. These designs – complete with eye-catching graphics and bold, vibrant colors – balance the right amount of visual interest with important information, to convert awestruck passersby into tangible sales. Vehicle and fleet wraps let you rule the road with your logo, company name, website, phone number and more – all right in front of the eyes of potential clients. A full-scope marketing strategy, including large vinyl graphics and vehicle decals, takes your advertising on the road to stretch your dollar. Wraps can take up a portion or cover the entire vehicle, depending on your needs and budget. Because these graphics are specifically fabricated for cars, you won’t have to worry about messy or unprofessional-looking logos haphazardly slapped on a side window or door. Not only do vehicle and fleet wraps elevate your company aesthetic and foster brand awareness, they also have one of the strongest ROIs of any marketing or advertising strategy. The average driver travels around 37 miles every day, putting your message in front of thousands of eyes daily. In fact, fleet wraps can average a staggering 30,000 to 70,000 views per day, depending on the vehicle’s location. That means vehicle wraps are one of the lowest-cost-per-impression marketing tactics, with some experts valuing them at $0.04 per thousand views. Even better, the consumers seeing your message already live in or near your service area. This audience is full of tangible leads, making vehicle wraps a laser-focused marketing approach that lets you zero in on your exact target demographic. In addition to getting your brand in front of the right audience, vehicle wraps are also some of the most memorable forms of advertising. In fact, mobile media billboards tout a 97 percent recall rate, significantly higher than consumers’ recall rate for ads on TV, radio and even online. Vehicle wraps put your message in front of thousands of your target consumers, and even more importantly, they’ll remember it. From a well-placed tagline to a moving visual catalog of your company’s products or services, vehicle and fleet wraps are some of the most important visual marketing tactics you can leverage. As a cleaning service brand, partnering with a graphics and signage company like SpeedPro Imaging is one of the easiest ways to instantly boost your business. With comprehensive and cohesive designs for each vehicle wrap in your fleet, we combine form and function to grab drivers’ attention and convert passersby into paying customers. Because every client’s needs are unique, our team provides personalized consultations to learn about your needs and goals for each car wrap. 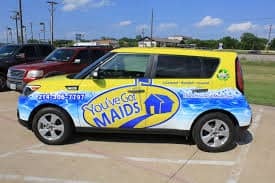 Throughout National Spring Cleaning Week and beyond, informative and eye-catching vehicle wraps can drive brand awareness and position your company as the go-to cleaning service in the area. For brands like yours, whose employees are frequently on the road, the value of your investment just compounds with every mile covered. Your local SpeedPro team can help you get set up with a vehicle wrap that will promote your brand and send customers your way. Find a studio near you.